Where is the TOMIX stuff? Haven't seen any. Here's the new 3-car pack with Thomas now having a CGI face. The links to the sets are there too. hope they extend the range to include Gordon and Edward as they initially promised. Well, I'd be happy with just the Original Six too. (I don't believe there was ever an Edward rumor along with the confirmed-to-have-been-cancelled Gordon.) But there's three more engines to re-release before they get there, if they go there at all. I just hope, if they re-release the freight car packs, that they don't cost almost as much as the engines used to. I find it ridiculous that people are unironically asking $150 for a truck and a van on eBay when the whole range looks (tentatively) to be re-released over time. If Tomix's revival results to Gordon finally being produced along with other new engines like Edward and Toby being released, then I will be looking into collecting N scale Thomas models again. 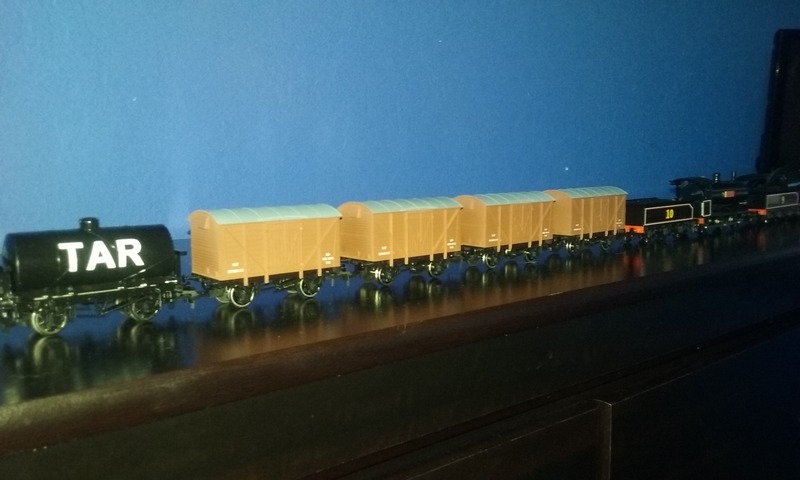 I'm pleased to announce that for Christmas, I got Bachmann Toad, Troublesome Truck #4, and the ice cream wagon. All are great models. ^Nice presents you have there, DinoNTrains! What is the Ice Cream Wagon like? I don't own of those (Yet), but I've been thinking about getting one! Also, would it be possible to post some ore pictures of you're layout, in the near future? I would love to see more pictures. I've just ordered Troublesome Truck #5 on eBay, from OmniModels! Should be with me from 4th January onwards, apparently! I'm vey happy! Now I won't get my Troublesome Truck #5 from the 4th January onwards. I've had an email from the business I've bought it from and they are out of stock. Now I'm on the back-order for one! I hope I don't have to wait to long for it. OmniModels emailed me to say Troublesome Truck #5 has come back into stock and they asked me to confirm if I want it dispatched to me and I said "YES"! I received an email at 16:37, UK time zone, to say that my Troublesome Truck #5 has been dispatched! @WilsonProductions2: The Ice Cream Wagon is really nice. It's a little smaller than I imagined (as in, it's shorter height-wise than the ventilated van. And I thought it would be taller.). But other than that, I really like it! As for the layout, I'll have to see if there's a current layout thread here. I'd love to share more pics of my layout. ^ I thought that the Ice Cream Wagon's height is shorter compared to the Ventilated Van, of seeing pictures on the Internet. I thought I could be seeing things! Do you think I should get it, even though I own the Hornby Ice Cream Van? Thanks. You could always create a Layout Thread, if you can't find an existing one. So recently the motor on my Bachmann Mavis burned out and I had to mail it to Bachmann to have the motor replaced. So even though it's not a new acquisition per se, while running this model again it ran like it was brand new and I found myself thinking about how overlooked this model is compared to a lot of the other models they came before and after it. So I figured that I would do a review of her since I believe she didn't get enough credit when she first came out. So I figured would talk about the Bachmann Mavis, so here are my thoughts on her. Mavis was first announced with Edward back in 2007 not long after Toby and Spencer came out while Emily was delayed. By the time both of the models came out in 2008 they seemed to be very popular, but it was all too obvious that compared to the two, Edward was not only the better model but also had better sales and overall reception. This was because Edward was at a much higher demand then Mavis, and is a lot more of a popular character and well-known face to the younger audiences. Mavis on the other hand, was a lot more of a minor character despite being a classic character as well as not having a model available by Hornby prior to her Bachmann announcement her popularity just could not keep up with Edward's. Despite this, I feel that her addition to the range was completely natural, despite her roles being fairly minor, she was a very iconic character and was the main "token female character" until Emily was introduced. It's really no surprise that Bachmann would announce her as she managed to appear briefly and every season since her debut. She isn't the best model in the range by any means, but compared to the other two female characters that are currently in the range, I think Mavis is definitely the best one. In terms of aesthetics, they really hit the nail with the hammer on Mavis' design as it really resembles her appearance from season 6-11 since this was the most up-to-date design choice at the time of production. This is most notably in regards to the facial expression given to the model as while it is a classic grin that's been seen since the third season, Bachmann had the eyebrows painted in the same way during the later era of the show. One common complaint I've heard about Mavis (or other diesel engines from the range in general) is how the windows are painted silver to hide the motor inside the model. Personally this never bothered me, it might look a little bit off since it was never like this on the show, but if anyone is really bothered, it's a simple modification they can fix up themselves. Aside from that though, I have no complaints on the design of the Mavis model as I think it's design is spot-on just like the Edward model that came out at the time as both of these models were a step up compared to its predecessors. In terms of running power, Mavis reuses the exact same motor and chassis as Toby. This is probably another reason why Bachmann made a model of her, as well as having such a simple design to work with. Why Bachmann hasn't looked into her yet for large scale is beyond me, but I'll leave that for a large scale collector to go in depth on that one at their own time. So with that in mind, the Mavis model does run pretty smoothly, just like the Toby model. And while also using the same motor is Toby it is also evident that Mavis is not exactly a strong hauler. Personally I would've preferred to see Mavis be a better hauler with more weight added than Toby seeing as how she is a more modern locomotive and could actually probably pull a lot more than Toby on the show. Really though at the end of the day, Mavis doesn't typically pull a lot of rolling stock on the show so it wouldn't really make a huge difference to the consumers and Bachmann themselves. If you give Mavis a couple of wagons, loaded or not, the performance that you would be looking for the model should be just fine. Do not expect anything extraordinary out of this model though, otherwise you might find yourself disappointed with the model in this area. Overall, while this review was basically a blast from the past, it's good to look back at old models from the range to and I personally think that Mavis still holds up pretty well to this very day. I would honestly still stand by my belief that this is the best model of a female character in the Thomas range and comes highly recommended by me. If you do not have this model already, I would honestly encourage you to look into buying this model while you still can. If you are a classic series fan or even just a collector of Thomas models in general, I would say that this model is definitely worth looking into. It may seem a little random for me to review her but seeing as how she recently got fixed from Bachmann I figured this would be a good way to show appreciation for them. Plus I also think it's a good time to encourage others to look into this model because (unlike stupid Rosie) Mavis is a good quality model that would look great in anyone's collection and is actually worth the investment. A huge thank you to Bachmann's service department for getting this model back to me in good working order. It's great knowing that Bachmann is not only great for producing quality models but their service department really deserves all they credit they can get. Bought some Dapol Vans off Ehattons. You say the colors possibly aren't accurate to Thomas & Friends, but personally I don't think you're too far off from basically having this. Overall I think they look pretty good. Kind of makes me wish I was still modeling in HO/OO scales. Hoping to get my hands on a few of Bachmann's large scale vans to add to my collection and maybe make a 3rd troublesome truck unless Bachmann beats me too it. Might do an in-depth review on this later, but I was debating on getting this or the square water tower. Upon closer inspection (for once the blister packaging was helpful) and I noticed that the square water tower looked way to small in comparison to an engine. Therefore I went with the round one, since it was cheaper, better details, and looked much better in size. Only modification I made to the water tower was a simple one... just added water! I also picked up some logs to replace my old ones. They were made by a local company in my state, Oregon, and I picked up about three packs for 5 dollars each. The result was far more satisfying than my older logs since I got those for free. 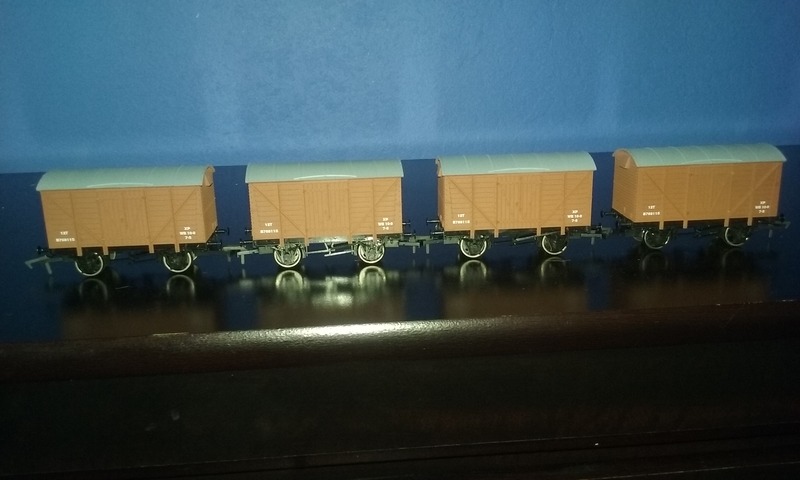 These logs, while I had to pay for them, have much better details carved into them and I am really happy to have log cars on my set up... no need to buy Bachmann log cars if they were ever announced. Going back to the earlier subject, would anyone like to hear my thoughts on the water tower(s)? I can only speak for myself, but I'd certainly be interested in hearing an in-depth review of the water tower you recently got, Chaz.